Francis Kurkdjian’s work has a certain flair and easiness about it that should never be mistaken for simplicity. His fragrances paint a clear picture of the idea Mr. Kurkdjian had in his mind and communicate his message, be it of the man-eater femme fatale in furs of Absolue pour le Soir, the height of luxury of his Oud, or in the case of his newest perfume, Amyris, daytime Chic Parisienne. I’m not necessarily one of the devoted admirers of everything about Parisian women. I‘ve seen more fashion victims on the Metro than on the average NYC street. But there is something about the ones who get it right, with their gray and navy outfits, hint of color here and there, and perfect accessorizing. So, yes, I do want to smell like that. Francis Kurkdjian’s Amyris is not very perfumy. It’s a light veil of a transparent iris that lets the sunshine in through a delicate greenish citrus (beautiful lemon leaf. I want a full bath and body line based on this note alone). Amyris dries down into a skin-level musky vetiver; again: nothing is sharp, no note takes over, and there’s no obvious hook. The fragrance just smells attractive and compelling without calling special attention to its presence. I tried a very heavy application (six sprays plus a couple more just before leaving the house); just to see where I can take it. Not very far, apparently, as Amyris remains easy-going and non-intrusive. It’s also not very memorable, other than the fact it’s carefully composed and executed. As you can imagine, Amyris has a minimal sillage and doesn't project much. It lasts nicely, though, and the dry-powdery-musky base remains on skin and gives people a reason to lean closer for long hours. Basically, I’d say this is a perfect office scent that smells tasteful and expensive, without distracting the wearer away from her spreadsheets and conference calls . As for gender, while this is Amyris Femme, I would be just as happy to smell it on a man (and I did. It’s as gentle and neutral on the husband as it’s on my skin). I’d say that a man who doesn’t shy away from dry florals will enjoy this fragrance. Notes: lemon leaf, orange leaf, elemi balsam, Californian orange, Jamaican amyris, Florentine iris, Haitian vetiver, musky amber. 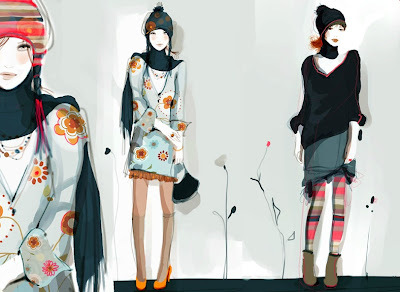 Image: Sophie Griotto fashion illustration via trendland.net.